This is a scanned image of the original 1889 drawing. The “original” is referred to as a “tracing”. The name refers to the method used to produce the drawing. First, a preliminary design drawing on paper is produced, and when the design is pronounced finished, a piece of “tracing cloth” is laid over it. A “tracing” is made by the draftsman using “india ink” and various types of ink pens. This is a 1911 tracing and the method used to make if remains the same as in 1889. “india ink” came as solid, not a liquid. A gentleman named Higgins made the “mixing” bowl obsolete. “tracings” are sometimes referred to as “linens” because “tracing cloth” was at first made of linen. However, linen was rapidly replaced by cotton. The cloth becomes “tracing cloth” after a coating of “sizing” is applied. The “sizing” is necessary to accept and hold the ink. Retired engineers have no shame. 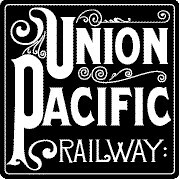 This “map” represents the Union Pacific steam era from 1884 to the bitter end. It does not include the OSL, SP,LA&SL, LA&SL, OR&N, OWR&N, et al. One of the “We can do this!’ group. He and others supplied what was “missing” and a “miracle” happened.